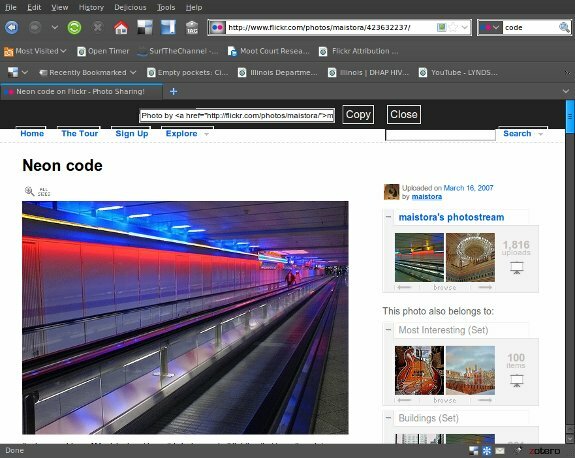 This is a jQuery bookmarklet to extract an attribution string and link from a Flickr photo page. At the time that I wrote this bookmarklet, I was using the the Monochrome Author theme (similar to the Monochrome Pro theme) by Graph Paper Press. It requires that you have an image associated with each post, so I frequently grab Creative Commons licensed photos for posts where I didn’t take a photo. I got tired of building the photo attribution string and link back to the photo by hand, so I made the bookmarklet to generate it with one click. This is my first attempt at writing a bookmarklet and using jQuery. I make use of the very helpful jQuery Bookmarklet by Brett Barros with modifications by Paul Irish as well as the zeroclipboard library for copying the text to the system clipboard. There are probably some bugs with this code as well as lots of room for improvement. In particular, it would be nice to have the z-index of the bar displayed by the widget set so it covers all the FLickr page elements, but I couldn’t set a high z-index without messing up the zeroclipboard functionality. I like this bookmarklet, but I advise the students in my social media class to also note the type of license when they attribute. Thus what I’d like to see in this bookmarklet is the option to a link to the license, i.e. : Photo by Kin Mun Lee via Flickr using a CC-BY-NC-ND license. Send me an email if you add this functionality. @Christopher Allen: Good idea. I tend to only use CC-licensed photos so I never thought of this functionality. @Christopher Allen: The bookmarklet adds the Creative Commons license to the attribution string now.